123Pet has the most powerful and simple appointment book available to help you manage your business. 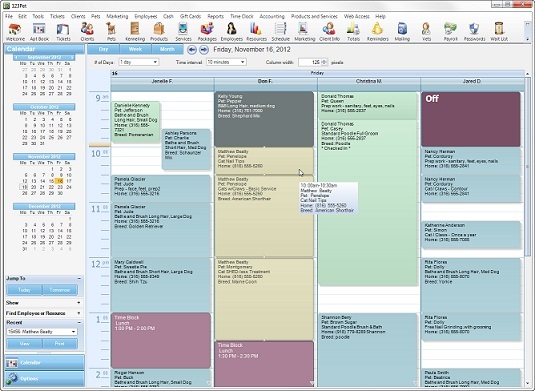 Customized color codes make it easy to view when an employee is available to book, what type of appointments you have for the day, and even determine who still needs to receive a confirmation call or e-mail. Book, rebook, check in clients, and so much more with just a couple of clicks. 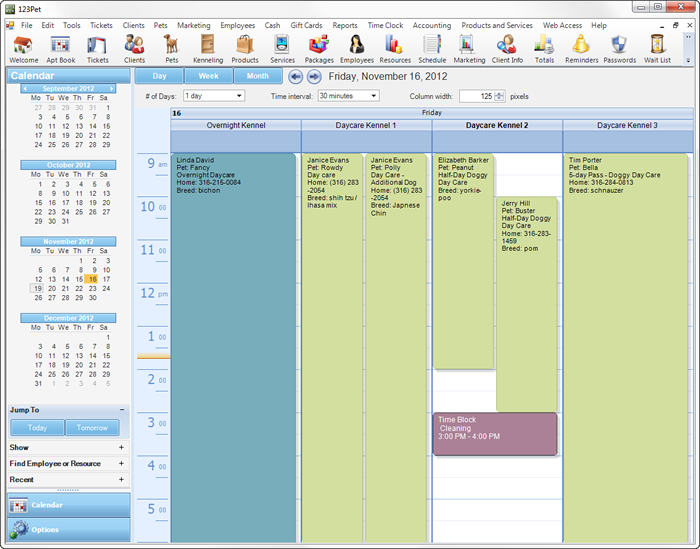 Creating an appointment is easy, and keeping your employees’ appointments organized is even easier with 123Pet. In addition to grooming appointments, 123Pet also offers multi-day services and resources. The appointment book will display a single	appointment for each boarding that spans the entire duration of the pet’s stay. Resources represent a specific kennel or boarding room in your business and they hold each of these boarding appointments. Each resource can have its own maximum occupancy setting to track how many services can be held at once. If you attempt to book an appointment with a resource that is full, you will receive a warning to prevent overbooking. The appointment book has special filters to quickly switch between grooming and boarding so you can always find what you’re looking for. 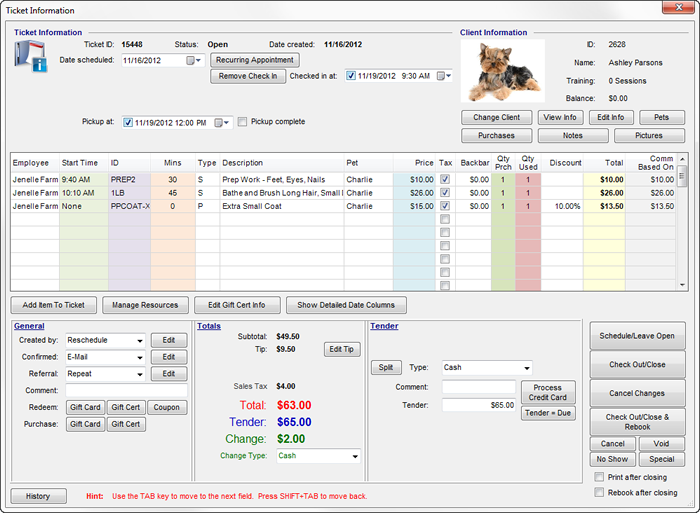 123Pet allows you to enter a list of services, prices, and descriptions that your business offers. Quickly add products or services to a ticket by scanning barcodes or looking up an item from an available list. Our pre-paid service feature now allows customers to pay for a series of services in advance to use at their leisure. The appointment book is directly integrated with the tickets that contain your product and service sales. 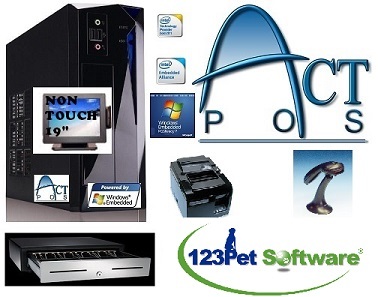 123Pet can store, display, and print an unlimited number of pictures of each pet which are conveniently linked to their profile. Use a web cam to take pictures directly through the software or add an existing photo already saved on the computer from a digital camera or scanner. Once the photo has been linked to the pet, it’s saved inside your database so you no longer have to clutter your computer with unorganized photos! Use the Picture Manager to save before and after photos of each pet you groom to show off the dramatic results. 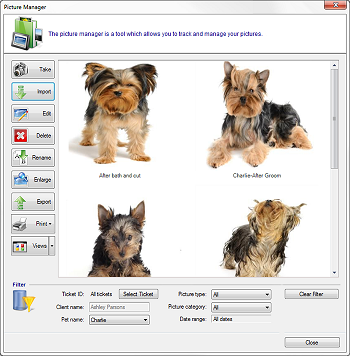 You can also save a primary pet picture to easily identify each pet when they walk through the door. 123Pet offers a fully customizable vaccination system with automatic alerts. As part of each pet’s medical history, you are able to link specific vaccinations to each animal and document when each vaccination expires. 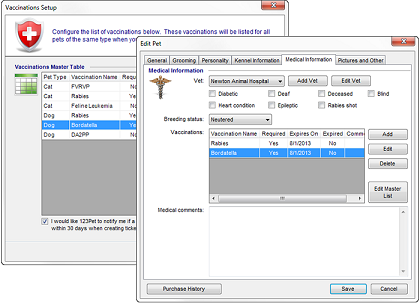 Each vaccination record can hold detailed notes and you can set if the shot is optional or required. If a vaccination is set to expire soon, the software will alert you that the pet is due for another shot when you create an appointment. This automatic tracking system makes it easy for you to remind your clients that their pet is due for another vaccination. 123Pet includes over 200 built-in reports that will help you to get details about your sales, clients, products, and so much more! 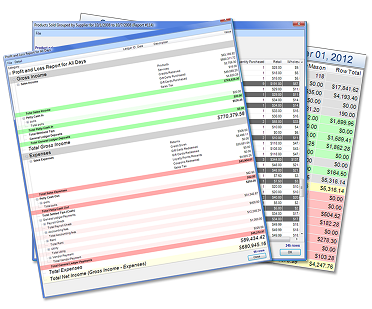 The built-in reports are easy-to-use and provide you with key details that will help you to run your business effectively. Most reports can be viewed in a simple grid as well as a full-color graph! You will be able to visually see all the information	about your business in a variety of ways, and export or print the information to keep on record. 123Pet allows you to track your products, including the quantity in stock, which is automatically updated every time a product is sold and inventory is received. 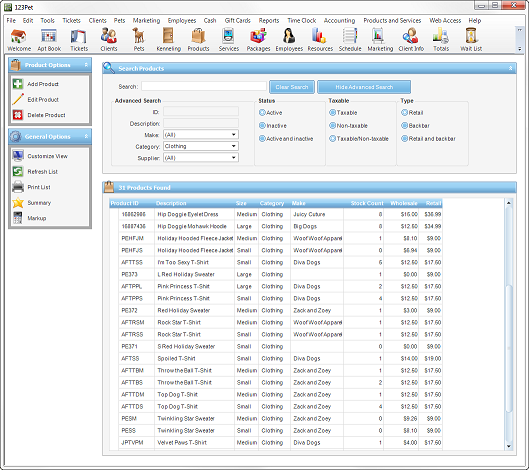 Our software works with barcode scanners so that you can quickly sell your products to clients or add new products to the database. With the 123Pet payroll system, there is no need to have an outsourced company or separate accounting program to manage your payroll. 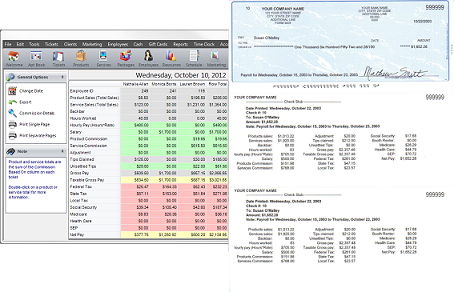 You will save time and money by letting your own business management software handle calculations and check printing! And much, much more. request a demo today!